Last week I was delighted to get an invitation to a new product launch party. 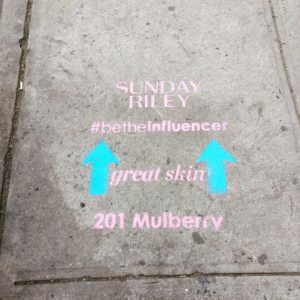 Sunday Riley is coming out with a foundation, and I got an invitation to their “Influencer” Launch Party?? You BET i was excited! The site told me to RSVP, so I quickly did so, noting that I could have a +1, which I accepted, so that I could bring my sister along – obviously something like this is way more fun when you bring a friend. Oh Good! I AM going the right way, thank you sidewalk! We passed into another room with a glitter confetti booth in one corner, a bathtub full of white balls, and opposite that, a giant rubber duck. 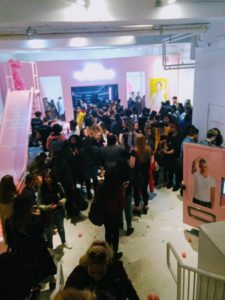 I also realized about this point that the NAME of the foundation was Influencer, and the implication that this was any sort of exclusive launch party was apparently unfounded. Lots of people seemed to be stopping here in order to get a cute picture, but I was focused on checking out the products so we continued into the main event. When I said I wanted to rub shoulders with other beauty enthusiasts, this isn’t what I meant! Honestly, it was not easy to get these. As I mentioned, the bins kept getting cleared out. This was likely due to the many people I saw grabbing handfuls of each one. This really bummed me out. I know what it is to be excited about samples, but I always try to be considerate. Would I have loved to get ten sample bottles of Good Genes? Of course! That’s a very expensive product and it would be awesome to have a large supply of it for free; but I also knew everyone else there would like to get a sample of it, so I got one. It’s not so uncool to be considerate of your fellow enthusiasts is it? So much of the online beauty community I’ve experienced is so welcoming, positive and friendly. Everyone is always ready to share a tip or alert others to an amazing sale, I always find the best comment sections are the ones where people are talking beauty & skincare! I guess I was really expecting that “we’re all friends here” sort of feel to translate, and seeing this everyone-for-themself sort of behavior was a real let down for me. I was actually pretty excited to get these samples! I have actually already tried the orange tube, that is the CEO Vitamin C Brightening Serum, because I got a full size sample from Allure Beauty Box. (Seriously, isn’t that awesome? 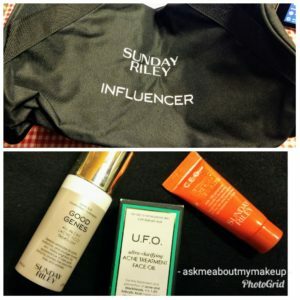 I think the Allure box is very underrated, but this is a tangent). I love it and having a little travel size of it is great. The U.F.O. oil is a clarifying treatment that helps clear pores and acne, which is a very welcome item- nothing like fighting wrinkles and acne at the same time am I right? Finally is the Good Genes Lactic Acid treatment, which seems to be quite the workhorse; according to its label it’s exfoliating, clarifying, brightens dark spots and helps reduce the appearance of fine lines & wrinkles. I can’t wait to see if these all live up to the hype they’ve been getting. After our continued wait (which was rather uncomfortable – our line was blocking the caterer’s exit door, so the poor wait staff kept having to fight their way in and out), we finally got to the makeup artist. This woman was incredible, super friendly and knowledgeable. Despite the crazy conditions, she didn’t make us feel rushed, and she practically guessed our correct color on sight. (She did swatches and some partial application to confirm.) She gave us little slips with our foundation shade numbers on them and let us know we could get a tube from the pink vending machine by the exit. There were supposedly a few more fun areas in the back, but after waiting nearly an hour for our shade match, we looked at the densely packed crowd in that direction and gave up. We decided to pick up our foundation and leave more space in the tiny venue for other hopeful fans. By the time we got to the vending machine, the front of it was swung open, and several (rather harried looking) staff members were manually handing out bottles, I told them our shade (my sister and I are the same shade in most foundations) and was promptly informed they were out of our shade, 130. My sister gestured for me to make the call, and I accepted the next shade lighter, 120 for us. We finally had the new foundation, and after a brief conference, we decided to get out. 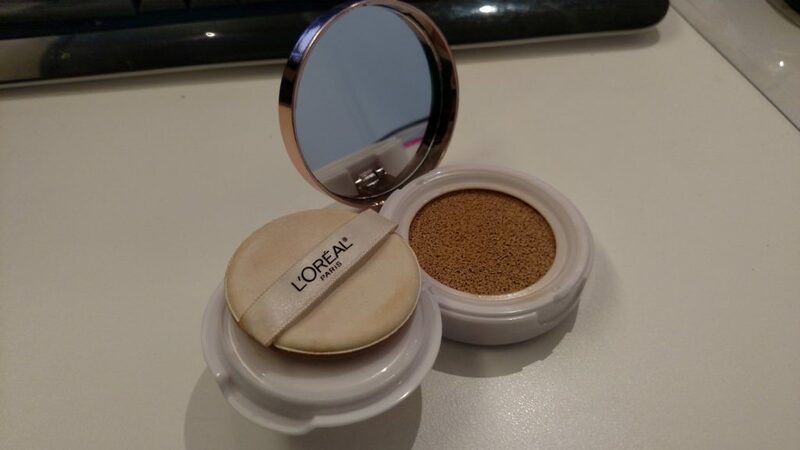 Overall, I am excited to have this new foundation to try, it has a lovely texture and it really does seem to cover redness well. However, I hope most launch events are better organized than this one. 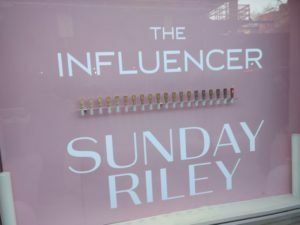 Don’t get me wrong, I do love Sunday Riley, I think their products are beautifully designed, and the things I’ve tried so far have been wonderful. But the layout of this event was very frustrating, and the lack of crowd control made us feel very disregarded. There wasn’t any sense of structure, not much in the way of a formal welcome- even some sort of floor plan indicating all the areas could have proved helpful. I think a lot of people used the vending machine as soon as they arrived, without receiving a shade consultation, since there were no signs or other instructions. We found the tote bags by luck, and pretty much had to figure things out for ourselves. Not what I expected from a luxury brand’s launch party. All in all, my favorite part of the evening was probably spending time with my sister, because ultimately when you’re going to any sort of crowded event you should bring someone who can make standing in line fun. 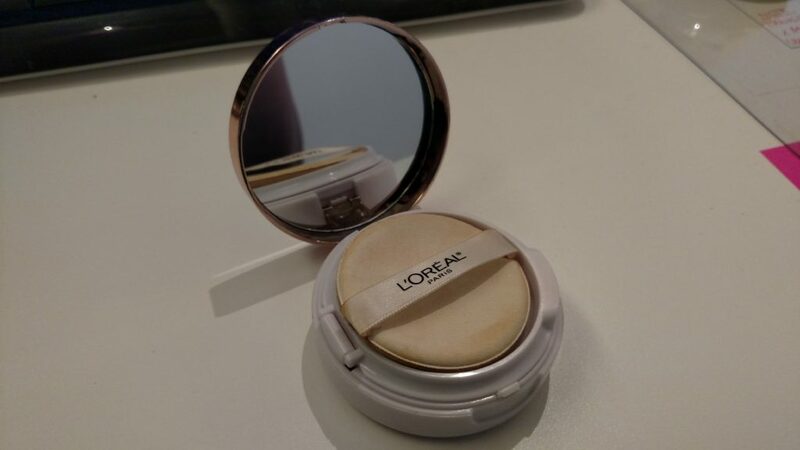 I’ve been hearing about cushion compacts for a while now, first from Korean beauty brands, and now brands more local to me are joining in. Now that they’re hitting my local stores, I thought I would try one out. And here’s the famous cushion! The tray where this sponge sits opens with an audible snap, revealing the actual product. Its nice when dealing with a liquid product to see that it seals so well. There are brief directions printed on the back, with images. The first time I used this, I was a little confused. The process seemed too short, surely I missed something? But no, one of the major benefits of this format is how quickly you can apply it. This is a light coverage foundation for sure, but it still is able to smooth out the appearance of the skin for a more perfected look. The thinner, less absorbent applicator is actually quite nice to use, and make blending the foundation into the skin very quick and easy. 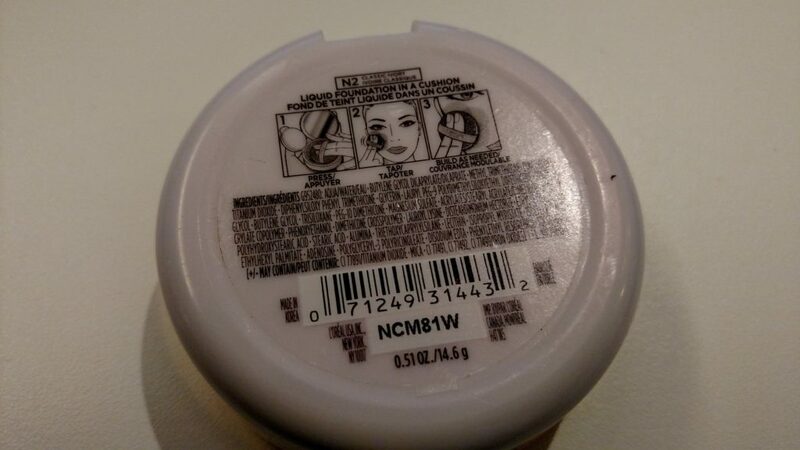 This is a great foundation for when you don’t want a lot of coverage and/or you need to get your face done quickly. 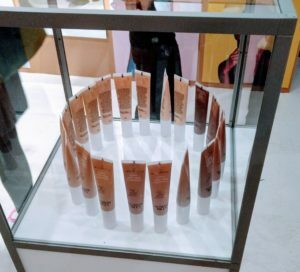 Even though it is a liquid, this foundation does not require much setting. If you have oily skin you will probably want to set it with powder to help it last longer. 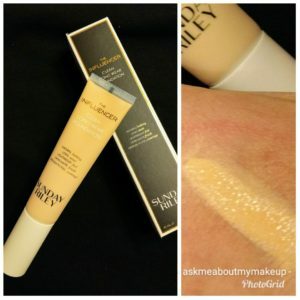 I have combination skin, so I generally only need to set my T-zone when using this foundation. Overall, I find this a very easy to use and likable product, and one I will likely repurchase when I finish it. Have you tried this product? Tell me what you think! 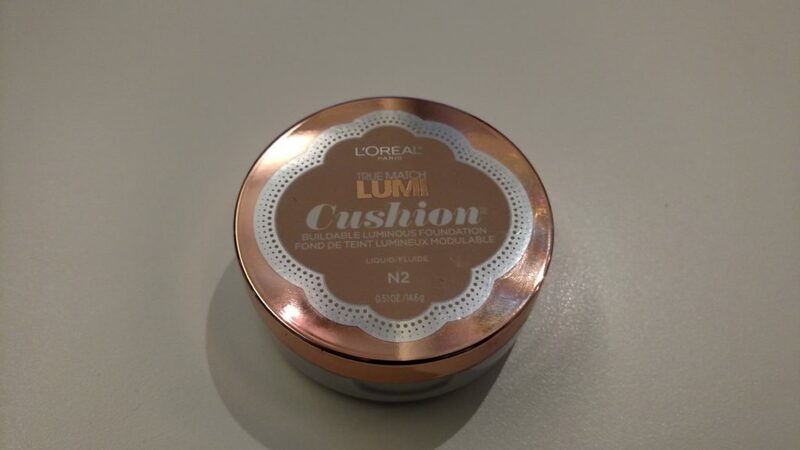 Is there a better cushion foundation I should try? Let me know in the comments! Disclosure: I purchased this product myself.